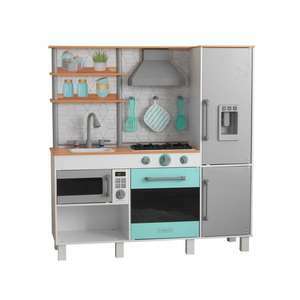 Serve up hours of imaginative fun for aspiring chefs with the KidKraft Gourmet Chef Play Kitchen with EZ Kraft Assembly™! Featuring a spacious refrigerator with play ice maker, a deep freezer and a microwave with a showcase door, this modern kitchen has everything gourmet chefs need to make mealtime deliciously fun. Three interactive knobs click when firing up the extra-large oven and cooktop with chic ventilation hood. Youngsters can learn practical skills as they play with the sink’s red and blue labeled handles to indicate hot and cold water. The included spoon, spatula and pot holder have their very own hanging pegs above the stove, and the shelf space above the sink makes learning to organize fun and easy. With the KidKraft Gourmet Chef Play Kitchen with EZ Kraft Assembly™, kids are bound to create tasty memories as they’re transformed into little chefs. Parents will love how fast and easy it is to assemble this play kitchen with the innovative EZ Kraft Assembly™ technology, which means less building time and more playing time! Excellent price, and knowing Costco and the brands they stock, it should be well made. Do you have to have a Costco membership to buy? I believe it's an extra 5% to purchase online if you don't have membership. Nothing about don't need to be a customer and pay 5% extra :-(. Am i right? How can i buy without a membership? Showing as £99.99 through link? Added back to site with another £60 on top!